Foundation problems in your commercial structure can be a huge issue. Not only are these problems a hazard for you, your customers, and your employees, but they can also be very expensive to fix. That is why it is vital to the well-being of you and your business that you contact the professional commercial foundation repair team at Pro Foundation Technology as soon as any problems are discovered. 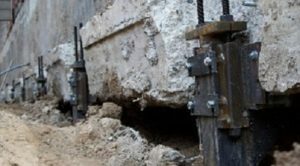 We can provide you with a solution to repair any damage caused by foundation failure, fix the underlying problems, and prevent any issues from arising in the future. Contact us today to learn more. These are telltale signs that you are dealing with a foundation problem. This kind of structural problem is usually caused by the sinking or shifting of the foundation. This can happen for a variety of reasons. One reason foundation begin to settle is the formation of voids under the concrete. This is often the result of soil shrinkage during dry, drought-like periods or erosion after heavy rainfall or snow melt. Settling foundations can also result from poor soil compaction under the foundation at the time that the structure was built and the foundation was laid. If the foundation of your commercial building is shifting, it could be due to excess hydrostatic pressure in the soil. Hydrostatic pressure increases and pushes on the foundation as the ground absorbs more water and the soil expands. This pressure can cause the foundation to shift and crack, leading to bowing or leaning walls and water entry in the basement. Steel Piers: These are installed under a sinking foundation to lift the concrete and provide long-lasting support. Because they are driven deep underground to anchor into solid soil layers, they provide the foundation with the stability it needs to remain level for years to come. Helical Piers: Also used for settling foundations, helical piers perform the same task that steel push piers do. The difference between the two types of piers is that helical piers are screwed into the ground, not driven in. This gives them added stability. Helical Tiebacks: Though these look a lot and work a lot like helical piers, they are actually used to correct leaning and bowing walls and straighten shifted foundations. Helical tiebacks are screwed into the ground horizontally (instead of vertically like helical piers) and are attached to the foundation wall to pull it into position. New Construction Piers: If you have a new commercial structure or are considering building one, you may want to consider investing in new construction piers. These piers support new foundations to prevent settlement before it occurs.